What a lovely display, nice shots! How many did you pick? I'd have taken an armful. I was just looking at a picture of a huge sunflower field with tour de france bicyclist riding through - very nicepic! Glad to see you're back on a regular basis! I love sunflowers! Just beautiful! PS I use to visit Wiesbaden when I was little - love the pics! 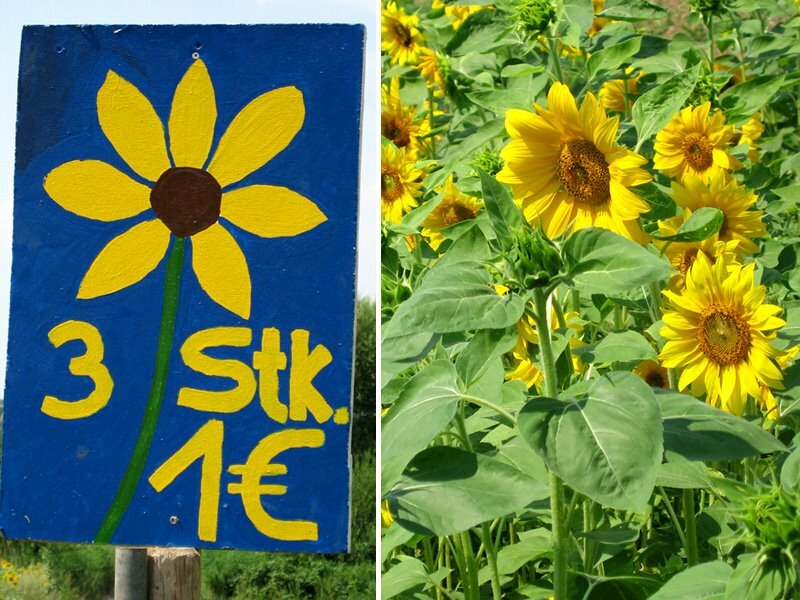 Beautiful sunflowers and great idea! Great flowers and...uhm 1 Euro per 3 flowers??? What a beautiful field of flowers. I love the fact you can pick your own and just leave the money in a box. Ooh, would that there were farms like that here in my part of the world. I would pick a fresh sunflower bouquet every week. very lovely.. I'll like a couple. Wonderful thought, a field full of sunflowers. The rainy road photo has a nice feeling to it too, you can almost hear the tires swishing on the wet road.